Classy sound coupled with an easy interface. Loads of adjustment options. Lovely tones. Boutique build. There's a boutique price, to match. The DLS RotoSIM features a charmingly uncluttered user interface, sporting easy-to-understand controls. "There's plenty more variation to be had if you fancy a tinker around inside the chassis"
A bypass switch turns the effect on, while a second footswitch toggles between slow and fast speeds that are set with a knob each. A ramp knob sets how quickly the speed changes. 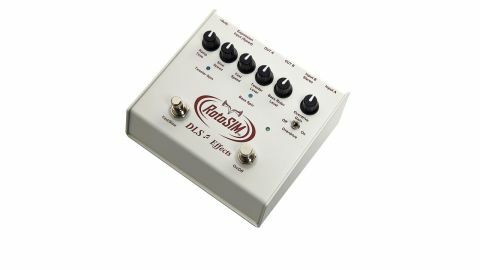 Separate knobs adjust the top and bass rotor levels, and an authentically- voiced overdrive - with the level controlled by a single knob - can be brought in with a mini-toggle switch. There's also plenty more variation to be had if you fancy a tinker around inside the chassis, with no less than seven more adjustments available. All in all, cool sound and smooth operation from a great US boutique pedal.